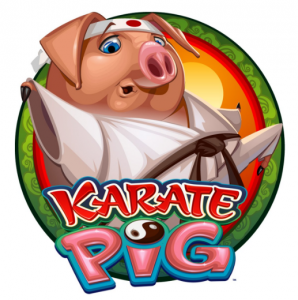 The Karate Pig slot is a great game to play if you want a fun take on this strict and serious form of martial arts. This video game features a Japanese pig who is a master of the martial arts – and a great sushi chef too. If that is not enough to admire, the pig is also a very skilled musician. As you may have guessed, this is a comical game that features the traditional elements of karate. The images used are hilarious but the jackpots are real and serious! This online slot machine runs on a Microgaming software and features 5-reels and up to 40 paylines. That means there is a higher chance of winning. The symbols that you will see includes the funny guises of the Karate Pig as a fierce Samurai warrior, Karate champion, and a romantic musician. Apart from that, the pig can be seen performing various tasks like preparing sushi, arranging a tea ceremony, drunk with sake, etc. The symbols are really silly and it adds to the fun elements in the Karate Pig slot game. But of course, that is not why you play the game. You want to play in order to win. When you play the game, there are various symbols that represent the martial arts. The Yin and Yang are there in the center of the Karate Pig logo. This can substitute all the other symbols to increase the chances of winning after a single spin. The free spin is symbolised by a Golden Swan Coin. In you get two anywhere from reels 1 to 5, you get 15 free spins. Not only that, you get to double all the payouts. If the two Golden Swan Coins reappear during the free spins you get another 15 free spins. The Bonus symbol is represented by the Karate Pig cleaning his plate. When three or more of these bonus symbols appear anywhere on the reels, the Karate Bonus game will be triggered. During the bonus game, you get to choose if you want to play the Pork Chop Bonus or the Hammer Bonus. Both games will allow you to win big cash prizes. With every successful bonus game, you will be awarded a Karate Belt. After the 7th belt (black belt), you will have the chance to play the Final Showdown. 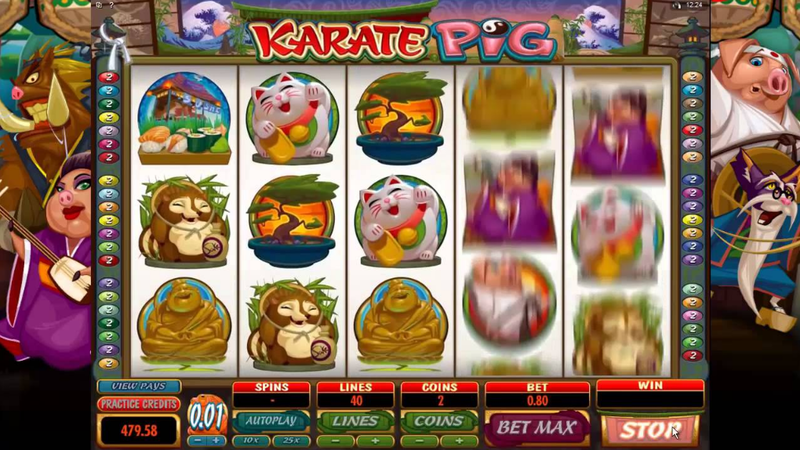 The Karate Pig slot game is a combination of Kung Fu Panda and Karate Kid. The comical element makes it a very interesting game to play. The opportunity to play for real money is an added bonus. The animation during the Bonus game is also very entertaining – seeing the pig try to break an ice cube. The graphics are superb – which is not surprising since it is brought about by Microgaming. The icons are large enough to be easily distinguished from each other. And the fact that there are up to 40 paylines makes it even more appealing. The more paylines, the more opportunities to win the prize money. The only downside is the low win value. Although the chances to win is frequent enough, the big prizes are hard to catch. The bonus game feature of being awarded a belt as one progresses into the game is a nice representation of the karate belts in real life. It is hard to determine how much will be won but the game describes huge prizes. While the free spins are great, it is harder to come by compared to the bonus game. All in all, the Karate Pig slot game boasts of hours of fun. Although the big prizes are hard to win, the comical feature, nevertheless, makes it an entertaining game to play.